Cook fettuccine as directed on package, omitting salt. Drain; return to saucepan. Cover to keep warm; set aside. Meanwhile, in medium bowl, stir milk, flour, salt, black pepper and red pepper with wire whisk until smooth. In 2-quart saucepan, melt butter over medium-low heat. Add garlic; cook 1 minute, stirring constantly (do not burn). With wire whisk, stir milk mixture into butter mixture in saucepan. Cook and stir over medium heat 6 to 8 minutes or until mixture thickens and boils. Stir in cream cheese until melted. Stir in Parmesan cheese until melted. 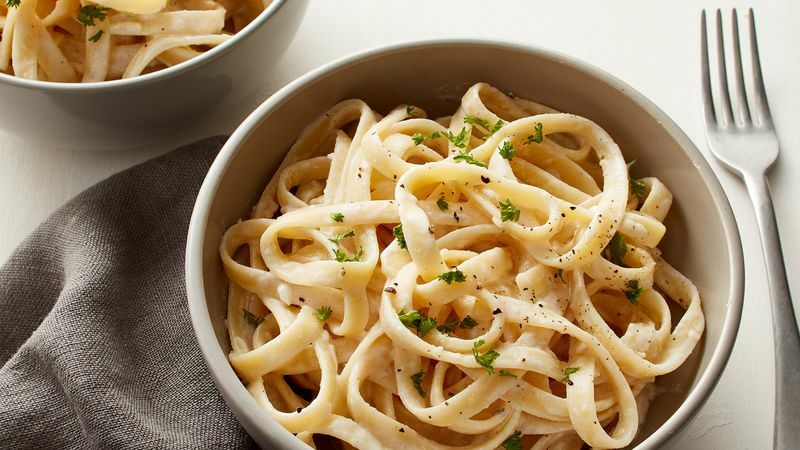 Pour over fettuccine; toss to coat. Sprinkle with parsley.